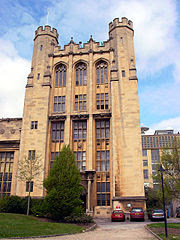 The University of Bristol is a university in Bristol, England. It received its Royal Charter in 1909, although its predecessor institution, University College, Bristol, had been in existence since 1876. It is one of the original "red brick" universities. Bristol ranks as one of the top 10 universities in the United Kingdom according to most published league tables. The University has an annual turnover of £260m and is the largest independent employer in Bristol. The University is a member of the Russell Group,European-wide Coimbra Group and the Worldwide Universities Network, of which the University's Vice-Chancellor Prof Eric Thomas is the current Chair. The most recent Research Assessment Exercise gave 15 departments a 5* rating.Bristol has around 23,000 students and is one of two universities in Bristol, the other being the more recently established University of the West of England. The University has gained press attention for its high private school intake and the 2003 dispute over its admissions system. 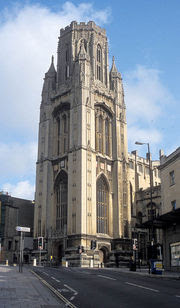 The University was preceded by University College, Bristol, founded in 1876, where its first lecture was attended by only 99 students. The University was able to apply for a Royal Charter due to the financial support of the Wills and Fry families, who made their fortunes in tobacco plantations and chocolate, respectively. Although the Wills Family made vast sums of money from the slave-produced plantations, they later became abolitionists who gave their money to the city of Bristol. The Royal Charter was gained in May 1909, with 288 undergraduates and 400 other students entering the University in October 1909. Henry Overton Wills III became its first chancellor. The University College was the first such institution in the country to admit women on the same basis as men. However, women were forbidden to take examinations in medicine until 1906. Since the founding of the University itself in 1909, it has grown considerably and is now one of the largest employers in the local area, although it is smaller by student numbers than the nearby University of the West of England. Bristol does not have a campus but is spread over a considerable geographic area. Most of its activities, however, are concentrated in the area of the city centre, referred to as the "University Precinct". It is a member of the Russell Group of research-led UK universities, the Coimbra Group of leading European universities and the Worldwide Universities Network WU League tables generally place Bristol within the top ten universities in the United Kingdom. Bristol is also known for its research strength, having 15 departments gaining the top grade of 5* in the 2001 Research Assessment Exercise. Overall, 36 out of 46 departments rated gained the top two ratings of 5 or 5*, and 76% of all the academic staff working in departments scored these top two levels. In terms of teaching strength, Bristol had an average Teaching Quality Assessment score of 22.05/24 before the TQA was abolished. For admission in October 2005, Bristol reported an average of 10.8 applications per place with the average A-level score on admission being 436.4.That year, Bristol's drop-out rate was 2.2% compared to the benchmark set by HEFCE of no more than 3.1%.